If I don't end up wildly successful in the Crafting world, I'm going to blame my parents. My therapist might think this is totally unreasonable, but I'm confident that they should have named me Heather. 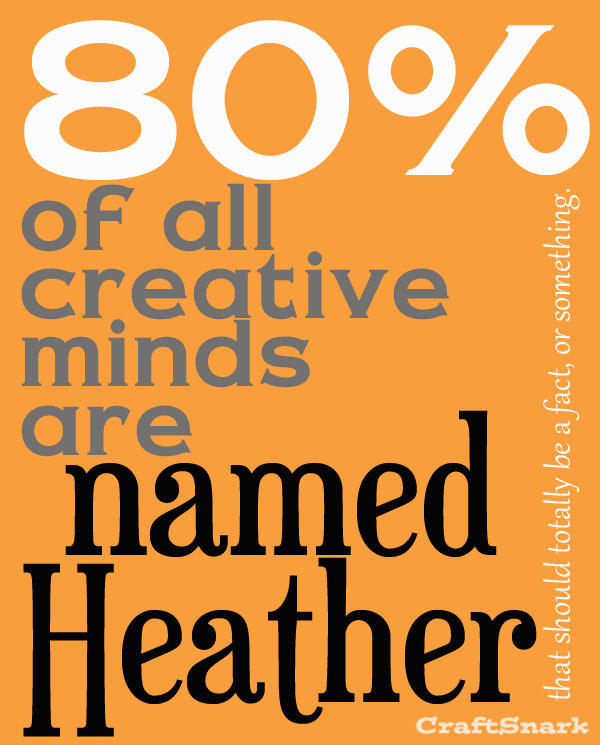 Because 80% of all creative minds are Heathers, and that should totally be a fact or something. Don't believe me? Check out all these creative Heathers... and I'm sure you can think of several that I've missed. Heather from Me Making Do, Heather from Just Lovely, Heather from Setting for Four, Heather from Vintage Living, Heather Johnson Photography, Heather from dooce, Writer Heather Lende, Inspire Me Heather, Heather from At The Picket Fence, Heather from Basil Momma, Food Blogger Heather Christo, Heather Jones from Oliver+S, Heather from Real Cheap Housewives of Texas, and Heather from Food For Thought. I'm Heather from Family Friendly Frugality and A Southern Mom!